Two Wilfrid Laurier University doctoral students in Geography, Timothy Ensom and Geoffrey Kershaw, won the 2018 W. Garfield Weston Award for Northern Research for their work studying the changing environment in Canada’s North. The award, which provides $50,000 in support over two years, is given to students who have shown exceptional promise, academic excellence, leadership and a strong commitment to northern research. Ensom is studying the temperatures and flow of streams between Inuvik and Tuktoyaktuk in the Northwest Territories. Because of climate change, shrubs seem to be growing and expanding across the tundra and holding more snow in stream channels. The extra snow and plants act as insulation, holding the summer heat in the earth longer. This may keep small streams flowing longer into the winter, which poses challenges for building and maintaining infrastructure, including the new Inuvik to Tuktoyaktuk Highway. It also has significant consequences for surrounding ecosystems. 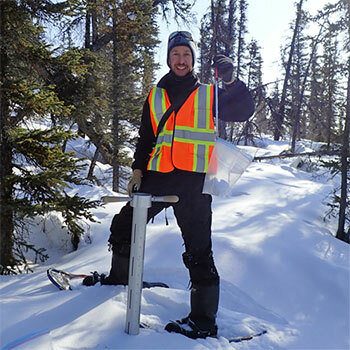 The newly built highway allows researchers like Ensom, his advisors, professors Philip Marsh and Steve Kokelj with the Northwest Territories Geological Survey, and others to study land that was more difficult to access in the past. Kershaw is studying the hydrology of a small basin in the Mackenzie Mountains in the Northwest Territories. In particular, he’s examining how different terrain types affect how water is stored, transported and lost throughout the year. These mountain areas are especially vulnerable to climate change, he says, and understanding how the landscape functions today can help scientists better understand and predict how similar environments will change as permafrost continues to thaw throughout the North. Kershaw and his advisor, Professor Bill Quinton, have been working with the local First Nations community, the Sahtú people, who live along the rivers downstream from the basin. The basin is not only their source of drinking water, but also shapes the landscape they live in and sustains the plants and animals they rely on. “If the highs and lows of those rivers change and become less predictable, the whole rhythm of access and subsistence is affected,” says Kershaw. For both researchers, the award means they can concentrate on their work without worrying so much about how they will pay the bills.